Méribel ski resort is the heart of the Les Trois Vallées, Europe’s largest interconnected ski resort. Because Méribel is located the very center of between Courchevel to the east, Les Menuires and Val Thorens to the south west, it’s a great place to stay on ski holiday in the 3 Valleys. Besides, Méribel is a very pretty ski village, with beautiful alpine chalets, gorgeous valley scenery surrounded by the French Alp peaks, and a family friendly atmosphere – lots of chalet hotels, local boutiques, après ski for the adults, and plenty to do after the ski lift stop for families. The ski slopes are also super scenic with spectacular views of Mont Blanc from Méribel. Méribel is considered France’s most well-designed ski resort, from its central location to the tasteful and traditional chalet architecture throughout the villages – very authentic compared to some French Alps ski towns which are not so quaint (La Plagne, Les Arcs, Les Menuires, Flaine, Tignes). There’s plenty of ski slopes in Méribel, most of which are above 1800 meters, the high elevation promises good snow. Kids will like skiing the World Cup and Olympic slalom runs, where Méribel hosted the 1992 Winter Olympics. Méribel also hosted the Olympic ice hockey and now you can visit the Olympic Park, which also holds a bowling alley, and a pool. 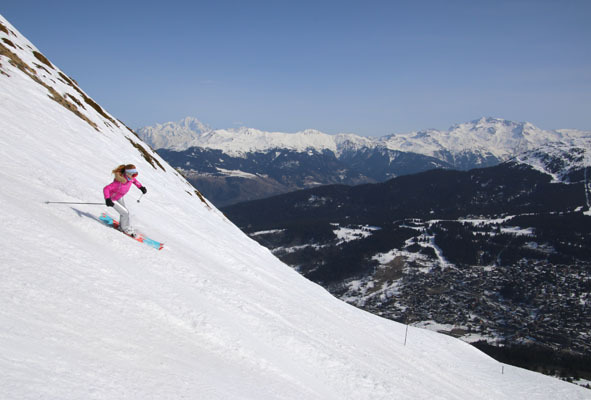 Meribel’s skiing offers great long trails on both sides of Méribel valley. Kids will love the Yeti Park, the border cross and fun zones around the slopes. To venture further, from Méribel you can ride one gondola, stay on at mid-station, and be at the summit of Courchevel or head in the other direction toward Les Menuires, and soon be skiing St Martin de Belleville and Val Thorens. Meribel has plenty well-located hotels and chalets to stay at, many ski in ski out. We found Rond Point to be perfectly ski in ski out at Rond Point, with a free bus down to the village, but you might prefer to stay closer to Meribel village is you like apres ski shopping and dining, and walking to the Méribel Olympic Park for après ski family style. Best Apres Ski at Méribel, the place to be is La Folie Douce, reached by the Saulire gondola, at 2pm a cabaret kicks off an afternoon party. They say its “soft après ski” meaning you can bring the kids but we aren’t sure about that unless you are looking to raise future drinkers and partiers. Rond Point also has après ski parties on the deck with live music from 5-7pm. Méribel is a great ski village for family ski holiday, in the heart of the biggest skiing resort in the world, and one of the Top French Family Ski Resorts.